Eucalyptus michaeliana is known as the Hillgrove Gum. The common name refers to the village of Hillgrove, east of Armidale on the Northern Tablelands of NSW. A large population, of Eucalyptus michaeliana, occurs near the village. The Hillgrove Gum is a medium to tall tree with a solitary trunk. The bark is deciduous, smooth with white to grey blotches. Bark is shed in plates or flakes. Leaves are 15 to 20 centimetres long by 2 to 3 centimetres wide, lanceolate, leathery, dark green on both surfaces with a prominent mid-vein. Buds are carried in clusters of from 3 to 7 and these are in groups of from 3 to 5. Flowers are white and 1.5 centimetres across. Flowers are an eye-catching feature because they are carried in unusually large clusters. Some plants are reputed to have purple or scarlet blooms. Blooms attract many insects. Spring is said to be the main flowering period. The specimens, in our cold climate garden, flower in February. Small gum nuts are barrel-shaped. Eucalyptus michaeliana is an attractive tree and could be cultivated as a “stand-alone” specimen or incorporated in shelterbelts or windbreaks. The species is probably too large for suburban gardens. 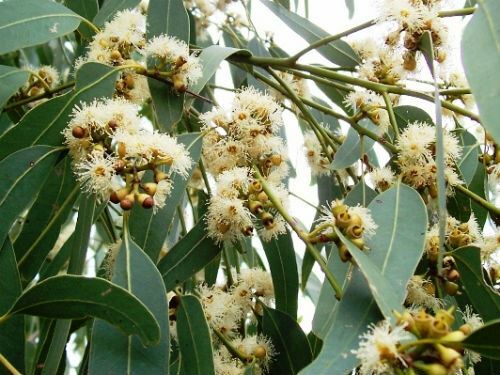 Eucalyptus michaeliana is considered to be an endangered species with three separate populations. One is situated near Wyong, north of Sydney; another is east of Armidale in northern New South Wales and the third in south-eastern Queensland. Cultivated specimens often have foliage almost to ground level.